I have only previously read two of Katie Price’s books which was Angel and Crystal but I wasn’t blown away by them enough to pick up her further releases. When I was sent her new book In The Name of Love I was expecting to feel the same about this one so I have had it sitting on the side for a few weeks avoiding picking it up. I have had various comments on Goodreads, Twitter and Facebook regarding Katie Price since I have started this book many saying they won’t be reading it as they are not a fan of hers. I wouldn’t say I am a fan of her in her usual job role but at the end of the day I love to read and regardless of who is writing the book if I enjoy it or not I will always give my honest opinion. Secondly it is also worth mentioning that Katie writes this book in partnership with Rebecca Farnworth. In The Name of Love follows Charlie who works as a sports presenter she is holidaying with best friend Zoe in Barbados when she falls for the gorgeous Spaniard Felipe but Charlie wants be loved for who she is not for what job she does so she keeps it a secret from Felipe but towards the end of their blossoming holiday romance Felipe finds out about Charlie’s secret and thinks she has an ulterior motive to try and sell a story about him now that he is tipped for a medal in the Olympics and so he slams the door in her face declaring her never wants to see her again. With the help of meddling friends the couple are brought together again but their relationship seems to be a rollercoaster of events with the odds stacked against their relationship it’s not looking likely to be a happy ever after scenario. Can Charlie solve the major problem that is troubling their relationship? 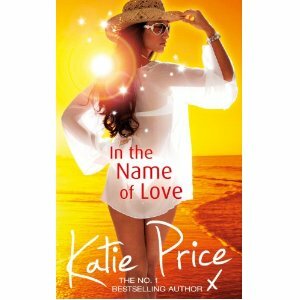 I love the cover of this book, if I was looking for a holiday read at this time of the year this would definitely be screaming at me from the shelves, ok so the lady on the front of the cover is very typical Katie Price look alike but all in all it is a fabulous summery cover which shouts glam. The book starts off how I expected very glamorous holidaying in Barbados but the characteristics I assumed I would find in the main character were actually in her best friend Zoe she was the one who was very glamorous took ages getting ready and wearing the must have outfit. Charlie herself was actually a genuinely nice character who didn’t seem to lead the typical celebrity life. I really didn’t expect to enjoy this as much as I did once the book got half way through I was speeding through the second half of the book and got carried away with the storyline, there were times where I wanted to shake both Charlie and Felipe but I still kept reading even though I was pretty sure I knew how it would end! Each of the characters where developed really well even the supporting characters there was never any confusion as to who was who. I took an instant dislike to Darcy who works with Charlie and seems to be the thorn in her side and I was sure that a situation in the book involved her but I was wrong! The storyline focused alot on equestrian which is an interest of Katie Price and her knowledge is shown in this book. I personally have no interest in horses but the book isn’t taken over with the topic it is just based around it. I was fully expecting to either not complete this book or be giving it a 2/3 star rating but this really surprised me how much I enjoyed it I am so glad I took a chance on this one I would pick another of her future books up after reading this. I have read a few of hers and whilst not a fan of her personally I have enjoyed the book(s) as they are so easy to read. Hadn't known this one existed, thanks for the review. Wow - that's an interesting review. I have seen the first two KP books on bookshelves and haven't even been tempted to pick them out - but you made me want to give this one a try. I liked the premise and would trust your review - so thanks Rea - I'll add this to my summer tbr list.